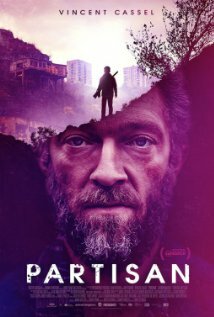 Movie Review: Charismatic French actor, Vincent Cassel, who continues very active during this year in “Tale of Tales”, “Child 44”, “Mon Roi” and “One Wild Moment”, sturdily plays Gregori, a commune's polygamous leader whose occupation consists in training his children so they can become remorseless assassins. The Australian “Partisan”, despite vacillatingly opaque in its developments, was a good vehicle for Mr. Cassel reassure his performing capabilities, this time as a controlling, egocentric villain with low moral values and an evil scheme carried out with the children’s mothers’ consent. The 11-year-old Alex (newcomer Jeremy Chabriel) is his brightest son, being always the first in the general knowledge tests, very precise in the shooting sessions, and coldly efficacious in the exterminating missions. Gregori is so proud of him that he constantly forgives the minor disobediences Alex is up to – he collects stuff from the outside world, deliberately interacts with strangers, buys meat for his unstable mother (newcomer Florence Mezzara), besides all the mischief associated with the kids in his age. However, Alex always showed a great respect for his protective, and simultaneously abusive father. On the contrary, Leo (Alex Balaganskiy), another sensitive kid who keeps disarming Gregori with wise words and antagonistic behaviors, doesn’t share this respect. When he fiercely holds onto a chicken in order to protect it from death and avoid its extinction, Gregori manages to punish him in his own guileful way. This is the moment when Alex, who swears to protect his newborn baby brother, starts acting in accordance to his own thoughts and not driven by his untrustworthy father. First-time director and co-writer, Ariel Kleiman, was able to set an appropriate moody atmosphere and also drawing unadulterated cold looks from the father and son. Yet, and without prejudice of what he did well, some secondary scenes are not so natural (Alex’s mother crisis is a good example) while we’re left a bit empty in regard to the motives and beliefs of the intriguing Gregori. Moreover, The film’s disconsolate climax, despite clear and transparent, felt somewhat hasty, triggering those typical bothersome sensations that arise from an undercooked plot.